Kebabs are misunderstood. Some confuse them with gyros, while others think they are all the same. Luckily enough, Blacksalt’s Taran Chadha, chef patron of Salt & Barrel, has launched his second restaurant with a mission to reinvent the meat dish. Indian kebabs often feature pieces of meat, whole or minced, skewered with a flat metal rod and grilled. The roasted meats are often spiced with a vibrant series of spicy punches, from chillies to cumin, coriander and more. Often bastardised as skewers of mystery meat marinated with a heavy load of spices to mask its off taste and a late night snack after copious drinking, Taran Chadha's is set to right the wrong of the wonderful treat. Salt & Barrel is a collaboration between chef Chadha and local breweries such as Black Kite and Kowloon Bay, as well as liquor retailer The Tramline Liquor Co. Recently opened in a quiet corner of Shek Tong Tsui, tucked behind the busiest high-traffic street at South Lane, Salt & Barrel fills the quiet street with an inviting complex aroma of spices and grilled meats. Contrary to a conventional restaurant concept, Salt & Barrel fuses the idea of a taproom and a kebaberie under the same roof. Entering the premise we were greeted with a vibrant palette of colours, blending rich murals with rustic fixtures, while warm hues on Mughal Empire-inspired artwork clashed with turquoise blue wall paint, adding energy to the space. The bar at the front of the restaurant seats 15, with a range of craft spirits and draft beer options for pairing with food. The main menu begins with a list of small plates, followed by a small selection of main dishes, each featuring one specific type of meat, spice profiles and suggested pairings for beverages. We began with the Muddiya Mattai kofte Scotch eggs, where a soft-boiled egg was wrapped with a meaty blend of spiced pork keema and chorizo sausage. Mixed well and evenly seasoned, the crumbed coating was thin but crunchy, encasing the tender meat layer and a mildly-molten yolk within the soft boiled egg. The pistachio gravy was lightly sweet and buttery, a great compliment to the meat and egg starter. Tadka tempered guacamole offered two parts of surprise: A rough guacamole and a grilled avocado half lined the base of the plate, topped with a scoop of mashed spiced lentils. The guacamole was served with crunchy beetroot chakli cookies and savoury miniature papadums, the crisp chips often served with mint and coriander chutney. The mix of lentils and guac add complexity in texture, and the spice level is milder than that of the Scotch eggs. Jackfruit chops were morsels of smashed potatoes mixed with sweet chunks of jackfruit. The tropical fruit’s honeyed sweetness was muted in this savoury preparation. Crunchy brussels sprouts pakoras were scattered all over, with a tangy green goddess sour cream dressing spread across the top. The dairy-based dressing had just the right tang to balance out the richness of the potatoes and pakoras and, mind you, the heat from the dressing packed a punch that may sneak up unexpectedly. Murgh Musallam featured a skewered leg of chicken stuffed with hard-boiled eggs before being slow-cooked and charcoal-grilled. The meaty local farm fresh chicken was served with a buttery chicken jus, but the winner was the spice marinade, with its welcoming punch of garam masala, Kashmiri chillies, and turmeric and rounded with sweet green cardamom, saffron, and yoghurt. The chicken was tender and juicy, while the charcoal gave it a welcoming toasty aroma. The Bihari Boti, or skewered Black angus hanger and flank steak with halloumi. A dark crust of black cardamom, cumin, peppercorns and chaat masala masked the meaty chunks of beef, crunchy on the outside but meltingly tender within. A strong touch of mustard packed the sharpness mellowed by the soft halloumi cheese and roasted garlic chive yoghurt sauce. We enjoyed these steak chunks with the beer naan served on the side. Salt & Barrel lacks a proper dessert menu, as the selection of sweets are on rotation and vary by the day. A fruit crumble made with cream of wheat may seem unusual to some, but the chai crème brulee was a reliable choice. Infused with the spiced tea, the creamy dessert was softly set with a thin caramel coating that cracked beautifully into sugary shards. The spiced infusion was light with just the right hint of cardamom and the custard made a wonderful end to a spicy meal. Beers are popular at Salt & Barrel, as many guests tend to order draft on tap. Wine by the glass option was modest, with at least two varieties available in each category of whites, reds, and sparkling. Those who would skip booze should opt for a lassi; the mango version was a crowd favourite, and despite being thinner than most, the fruitiness and sweetness made just the right balance from the tangy yoghurt, cleansing the palate from the spicy food. Service was keen and attentive at Salt & Barrel, although some members of staff could have a better understanding of food items in order to explain them to guests, but the service was warm with fair suggestions for beverage pairing and personal suggestions on food items for first-time guests. 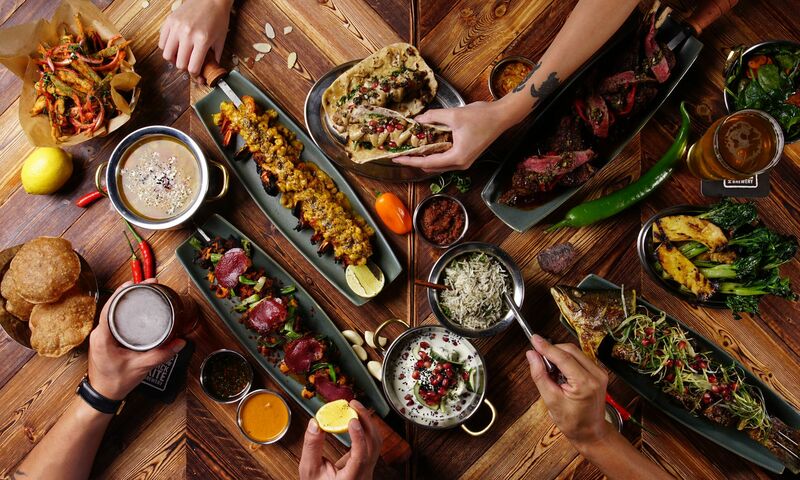 After the runaway success of Blacksalt, Chadha’s debut restaurant that celebrated his Indian heritage, Salt & Barrel proves that Chadra is capable of much more—his conscious effort to reinvent Indian kebabs is much appreciated, leaving guests happy as they are ready to return for more. Salt & Barrel, G/F One South Lane, Shek Tong Tsui, Kennedy Town, Hong Kong; +852 2761 4900. Dinner for two with one beverage amounts to HK$1,300.